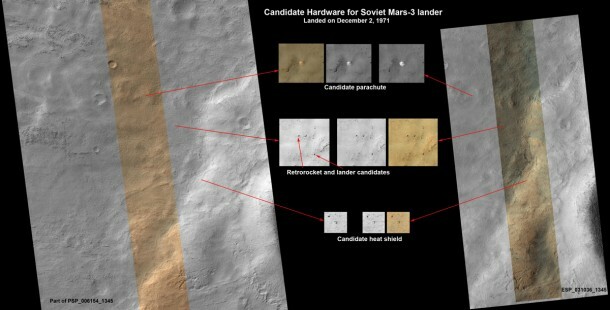 Hardware from a spacecraft that the Soviet Union landed on Mars in 1971 might appear in images from NASA’s Mars Reconnaissance Orbiter. While following news about Mars and NASA’s Curiosity rover, Russian citizen enthusiasts found four features in a five-year-old image from Mars Reconnaissance Orbiter that resemble four pieces of hardware from the Soviet Mars 3 mission: the parachute, heat shield, terminal retrorocket and lander. A follow-up image by the orbiter from last month shows the same features. Vitali Egorov from St. Petersburg, Russia, heads the largest Russian Internet community about Curiosity. His subscribers did the preliminary search for Mars 3 via crowdsourcing. Egorov modeled what Mars 3 hardware pieces should look like in a HiRISE image, and the group carefully searched the many small features in this large image, finding what appear to be viable candidates in the southern part of the scene. Each candidate has a size and shape consistent with the expected hardware, and they are arranged on the surface as expected from the entry, descent and landing sequence. HiRISE is operated by the University of Arizona, Tucson. The instrument was built by Ball Aerospace & Technologies Corp., Boulder, Colo. The Mars Reconnaissance Orbiter Project and Curiosity are managed by NASA’s Jet Propulsion Laboratory, Pasadena, Calif., for NASA’s Science Mission Directorate, Washington. JPL is a division of the California Institute of Technology in Pasadena.